In last week’s post, we discussed the bedrock strategy that Warrior Yoga is built on: Developing a personal ethos and how developing your ethos and code of conduct is the first, critical part of the journey in becoming a Warrior. As I mentioned in the post, the evolution of Warrior Yoga was at the heart of my search— both for my own personal development and to improve my work as a teacher—to discover the kind of integrated daily practice that opens up and refines physical, mental and spiritual capacities that lay in wait within each of us. For me, it was this brand of integrated, highly-potent practice that prepared me for the challenge of BUDS and a career as a Navy SEAL. As I detail in my upcoming book, Warrior Yoga, it took over a decade of experimentation with various yoga practices, from Ashtanga Yoga to Viniyoga, with many hundreds of hours of teacher training and applying that training in our programs at SEALFIT HQ, to come up with the specific mix of strategies and tactics that I believed work best for warrior development. #1. Wake Up & Develop a Personal Ethos. As mentioned last week, Warrior Yoga is in concert with the roots of yoga— it’s a complete personal development system. Whether it’s going into business for yourself, pursuing a college degree or joining the Navy with the intent of becoming a SEAL, the first order of business is to firmly establish your “why”—your hot-blooded, deep-down driving purpose. You want this purpose to be an expression of the depths of you and in alignment with your spiritual calling. That’s why the first strategy of Warrior Yoga is to ask the right questions and use a daily practice that will tune you into the right answers. #2. Optimize Functional Movement Capacity. 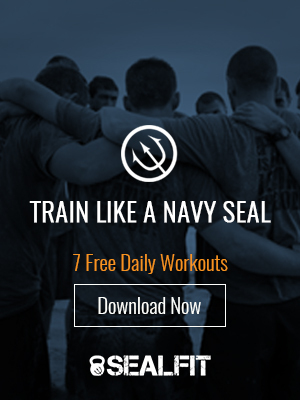 In the early chapters of Warrior Yoga I tell the story of how being called up from the Navy SEAL Reserves to serve in the Iraq War was the crucible in which I cooked up my very first Warrior Yoga session. Because time was extremely limited in the war zone, I began experimenting with the insertion of Grinder PT modules into my yoga sessions to make sure I covered all the bases. In an hour and a half or less, I left my patch of ground (near what formerly had been one of Saddam Hussein’s swimming pools) soaked in sweat, having executed training across the spectrum of capacities. This included high-end functional fitness—the very stuff of SEALFIT workouts—armed with nothing more than a kettle bell. #3. Cultivate Emotional Depth & Control. In the SEALFIT Blog we’ve talked at length about the ingredients necessary to build emotional resilience—the grit required to up your game when tackling the rigors that demanding goals require. Warrior Yoga offers practitioners a daily practice that hones the skills and the capacities that support these skills essential to building an omnipotent level of emotional resilience. #4. Master the Breath. Intertwined with cultivating emotional depth and control is mastering the breath. This is the fourth strategy embedded in Warrior Yoga. Martial artists and military special operators will immediately understand what I’m talking about: Mastering the breath is the key to a heightened, alert state of focus and a calmer body and mind. #5. Master the Senses. How does one directly train the senses so that he or she can swing open the “sense doors” we are born with? This goes beyond our textbook understanding of perceiving sights, sounds, smells and such. In Warrior Yoga, we want to develop the senses in such a keen fashion that we are privy to the most nuanced streams of information that are of particular important in a dangerous situation. If you are a combat veteran or first responder you know how important sensory awareness is in the field. Mastering the senses is how we go about empowering our innate gifts of intuition. This intuition has a priceless value when it comes to the battlefield, of course, but also in the athletic arena and the business world. As you flow from pose to pose in a Warrior Yoga session, you will be sharpening your senses that will ultimately lead to mastering the subtle language of wisdom that hides within. #6. The Pursuit of Integration. The sixth strategy of Warrior Yoga goes right to the central purpose of the “why” of yoga itself: Achieving a union of our egoic self with our soul self, and integration of our separate physical, mental, emotional, intuitional and spiritual aspects into a unified whole. When this happens we experience the Japanese warrior concept of “shibumi,” which means ‘effortless perfection.’ The fruits of a daily, consistent Warrior Yoga practice pays off with the ability to access your flow state at will. In addition, the work will extend into your professional life, as you will find an ability to effortlessly perfect your trade or art, as you are meant to with your innate skills and talents, and find joy in your work. That’s an overview, from 20,000-feet, of the foundational strategies of Warrior Yoga. Next week we’ll look at an example of a Warrior Yoga training session to get a look at how these strategies are ingrained into the practice. Until then, be safe, be present and train hard.